The job that was supposed to be your loved one’s livelihood ended up being the cause of your loved one’s death. If you are the spouse, child, or other dependent of the person who died then you may be able to recover workers’ compensation benefits. A child who is under the age of 18 or who is under the age of 24 and a full-time student. A child of any age who is mentally or physically incapacitated. A parent of the worker if the worker was under the age of 18 and lived with the parent at the time of death. In certain circumstances, other relatives may also be able to recover workers’ compensation benefits after a fatality. You will only be eligible to receive workers’ compensation benefits after the death of your loved one if your loved one would have been eligible for workers’ compensation benefits if he had lived. In other words, your loved one’s fatal injury or illness must have occurred because of something that happened during the course of work or in the work environment. It will not be enough to prove that your loved one died at work. If, for example, your loved one suffered a heart attack and happened to die at work, then the death is not necessarily work-related. However, if your loved one died in a fall, from exposure to toxic substances, or from another work-related event, then you may be eligible for workers’ compensation benefits. A spouse with no children will receive two-thirds of the worker’s average weekly wage. These benefits will continue for as long as the spouse does not remarry and remains financially dependent. A spouse who is also the parent of children eligible for benefits will receive two-thirds of the worker’s average weekly wage. These benefits will continue for as long as the spouse does not remarry and remains financially dependent. However, if the spouse remarries then the spouse will no longer receive benefits and, instead, each eligible child will receive $60 per week. Children will receive benefits until they reach the age of 18. Older children will continue to receive benefits if they are physically or mentally incapacitated and unable to support themselves. A spouse and children with a different parent. In this case, the spouse and the children share equally in two-thirds of the worker’s average weekly wage for as long as they are eligible for benefits. Other relatives, such as parents, may also receive workers’ compensation benefits in certain situations. 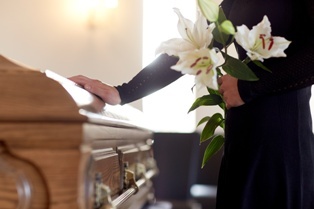 Additionally, families may receive compensation for funeral costs. Massachusetts law requires workers’ compensation to cover reasonable costs of burial up to eight times the current average weekly wage. The law, as described above, speaks in fractions of average weekly wages. We understand that you want a better idea of the actual dollar amount that you might recover and we know that figuring out all of this workers’ compensation information can be overwhelming while you are grieving the loss of your spouse, parent, or child. You don’t have to do this alone, however. Our workers’ compensation lawyers are here to help you at every stage of the process. Please contact us today via this website or by phone to schedule a free, no-obligation consultation and to learn more about how we can help you.